Day & Meyer, packing, shipping and storage, was formed around 1894 by Herbert W. Day (1867-?) and Gustave E. Meyer (1862?-?). They were located downtown on 5th Ave (around 27th St.) and on W. 31st St. until around 1906. They relocated to 341 4th Ave. (southeast corner of 25th St.) in 1906 and then moved uptown to 305 E. 61st St. in 1920. And it was around this time that they merged with Murray & Young, movers, to form the present company. Murray & Young were Thomas F. Murray (1887-?) and Chester Forrest Young (1884-1976). Click for ad from 1921. In 1927 Day & Meyer Murray & Young built their own building around the corner from 305 E. 61st St. at 1166 2nd Ave. Designed by the architectural firm of Moores & Dunford, 1166 2nd Ave. is a "largely windowless, high-rise storage warehouse ... with a hint of Art Deco in brick, limestone and terra-cotta" (quoting White & Willensky AIA Guide to New York City, 4th edtion, 2000). 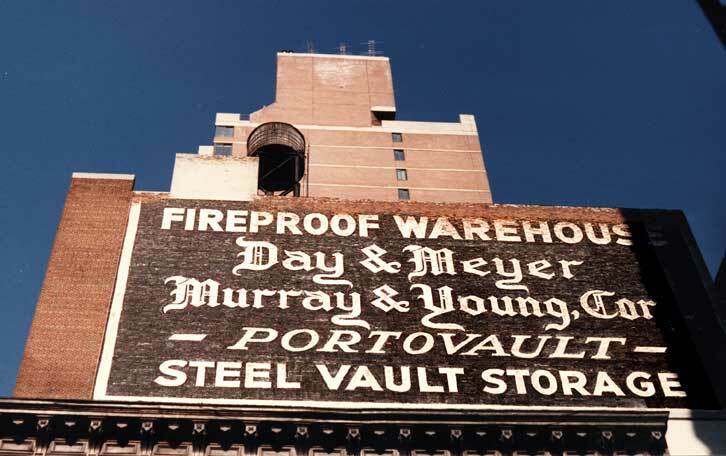 As of Feb. 2005, Day & Meyer Murray & Young are still very much in business (witness their truck on 5th Ave. 14 Oct 2004). The Portovault steel vault system dates from the 1920s, consisting of self-contained portable vaults to which only the owner has access. For more on this and other particulars of Day & Meyer Murray & Young take a look at their excellent web site www.dayandmeyer.com. This ad from 1943 shows the Portovault process in action.